Private donations of musical instruments or successful campaigns for specific equipment can make a big impact for music programs at area schools, but they are extremely rare. And the scarcity shows the wide gap between schools in wealthier and poorer neighborhoods. Ferris High School, in one of the more affluent parts of Spokane’s South Hill, has a strong music program. Band instructor Ben Brueggemeier set a goal of raising money for a five-octave rosewood marimba during the 2008-09 school year. The marimba has 60 wooden bars and costs $15,000. Fundraiser organizers came up with the idea to divide the cost of the instrument into 60 sponsorships – one for each bar – at $250 each. Brueggemeier thought the feat might take the full school year, but the sponsorships sold out in a month and a half. The powerful melodic thump of the largest marimba now stars in the percussion ensemble. A few years later, a well-to-do couple, also band parents, offered to spend as much as $8,000 to buy and donate a single large instrument to Brueggemeier’s program. 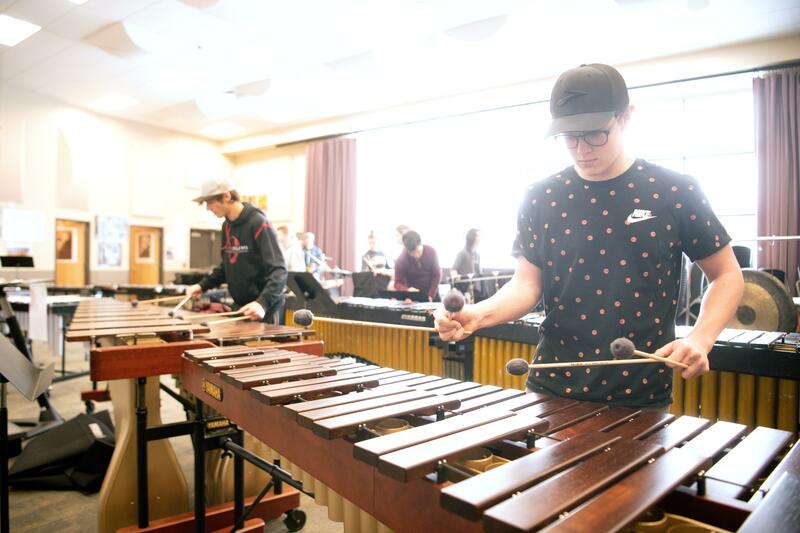 Brueggemeier hoped for another large marimba but knowing he needed $15,000, he asked the couple to hold off on their donation to allow him the time to raise the rest. The couple, who wished to remain anonymous, instead decided to fund the purchase of the second instrument completely. Most high school music programs don’t have the option to get expensive or exotic instruments, such as a grand piano, or even less common instruments like bassoons or English horns. If a student’s parents can afford to rent or buy a fine instrument, it can change the quality of a band or orchestra. Otherwise, band directors struggle to provide good quality instruments available for students. Spokane Public Schools has an account for repairs of existing instruments, which assures the upkeep and maintenance of district-owned instruments. Only a few schools have an active booster group behind their bands or choral groups. Lewis and Clark High School’s instrumental parent group puts on a handful of fundraisers, including a massive car wash in the fall. The money can pay for a few instruments each year. Teachers working in poorer neighborhoods though, may never see a significant donation. Band director Collins Loupe of North Central High School has never had a music booster group or a major donation, but appreciates that some of his former students have gifted their personal instruments back to the program, providing quality instruments for students whose parents can’t afford one. And Loupe has a sentimental attachment to the French horn bequeathed to his program by Michael Caldwell, the 30-year teacher who preceded him. Caldwell died in 2018. Some schools, like Central Valley High School, have a schoolwide booster organization to raise money for all activities rather than individual fundraising groups for each. It stops parent groups from wearing out the available goodwill of the school’s patrons to focus on any one single program. Nevertheless, Mike Elliot, the longtime vocal teacher at CVHS, received an unexpected gift of a late-model Wurlitzer grand piano in 2014 from a longtime Liberty Lake resident Darlene Stokke. “I like this (piano) because when I bring the kids around the piano the height is lower and it’s a comfortable feeling,” Elliott said.